Galaxy S Advance users can makes their phone much advance now as over a period of article, we’ll be checking out a tutorial to apply Official Gingerbread 2.3.6 firmware, dubbed as XXLE2 on your devices. This all new firmware fixes all bugs related to camera, Bluetooth and apps incompatibility issue. This update is a global release, so anyone can one owning a Galaxy S Advance can apply this update irrespective of which country their device belongs to. 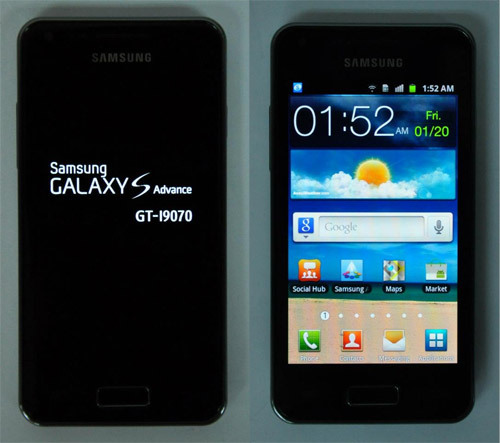 The tutorial we would see today is compatible only with Samsung Galaxy S Advance I9070. So, make sure you try this tutorial only on this device, not any other device by any company. Grab the XXLE2 Gingerbread 2.3.6 firmware Package from here to your Computer. And extract it. Next, download Odin and after that open it in your computer. Now you need to enter your device into download mode which can be entered by pressing and holding Volume Down key + Center key + Power button till the time you see a green robot on your phone confirming that you entered into download mode. Click on “PDA” tab to select .tar file and then finally click on ‘Start’ button present in Odin to start the process of firmware update. Next turn off the phone and enter it into recovery mode. In recovery mode, select the option of ‘wipe cache’ and clear cache by choosing the respective options. Congo, you’re done with your Android smartphone update. You are running on the updated version. You don’t need to apply this update.